Thinking about changing your cabinets? I was. I’d researched quite a few ways to refinish the cabinets and decided that refinishing was the way to go. Refacing would give a whole new look but would cost thousands of dollars. I also knew that I didn’t want to replace my cabinets because they offered a lot of storage for how small my kitchen is. 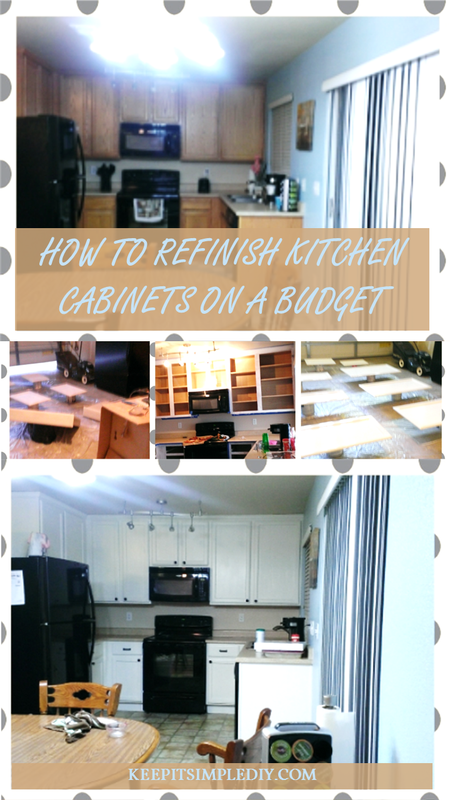 So, I took to the internet to see how to refinish the cabinets on my own. I found a lot of options, but here’s what I did. Step 1: Empty everything out of the drawers then remove the drawers. There is no need to take the drawer face off of the drawer. Step 2: Remove the cabinet doors and label the back with a piece of tape so you know where each door came from. Step 3: Remove the hardware from the cabinets. I used a labeling system with sandwich bags so I would be able to put the hardware back on the spot it came from. Ex: 1t, 1m, 1b, 2t, 2m, 2b, etc, where t- top, m- middle, b- bottom since each cabinet had three hinges. Put the hardware aside for safe keeping. Clean in vinegar if desired. Step 4: There’s many options from here forward, but since I decided to paint rather than stain the cabinets, here’s what I did. I sanded the fronts of all of the cabinet doors and drawer fronts with course grit sandpaper (80). You don’t need to remove all of the varnish, just make sure that the varnish is pretty roughed up so the paint will stick. Be sure to wear your protective gear to avoid getting the sanded varnish in your eyes or mouth. Step 5: Sand the whole surface with a fine grit sand paper (150) to smooth the surface. Step 6: Repeat until all cabinets and drawers are complete. Step 7: Sweep all of the sanding dust away then wipe all drawers and cabinets done with a wet rag. Set aside to try. Step 8: Remove all items from inside your cabinets. You may want to remove all items from the area surrounding the cabinets as well since sanding dust will fly around the whole level of the house. Step 9: Sand down all exterior parts of the cabinets using the same method as before then wipe with a wet cloth. Clean all of the dust from the area before moving to the next inside step. Step 10: Cover the ground with a drop cloth and lay out your cabinet doors and drawers so they are off of the ground. I used paint cans to hold up the cabinet doors and painted all of my level then all of my top after I was finished with the bottoms since there wasn’t enough room to do them all at once. Step 11: Use an oil based primer since there may be some varnish left on the surface. Use a paint brush to cover the exposed area with the primer and let dry. Note that the oil based primer is very hard to remove from any surface so be very careful. Step 12: Leave to dry (approximately 5 hours). I also left my garage door closed with a slight opening to allow the fumes to vent out but so the dirt and dust from outside wouldn’t blow in. Step 13: Turn cabinets over and prime the back side. At this point, you’ll have to move your labels so you don’t paint over them. I put the labels on the drop cloth by the cabinet so I didn’t lose their placement. Step 14: Head back inside and tape around all edges of the cabinets that touch the ceiling, walls, or floor. Step 15: Prime the exterior parts of the cabinets then leave to dry. Step 17: Repeat the process for the cabinets, drawers, and back sides of the cabinet doors. Step 18: Attach hardware if desired then re-attach the cabinet doors. And there it is! My kitchen looks so much more clean and even looks bigger and all for under $200! The biggest expense was the hardware. Without the hardware this project would have been complete under $100. Although, make sure you have a lot of time on your hands. This project also took me 50 hours to do by myself. That 5 hours between each coat is killer but so worth it! Cool blog post, it's so good to see a woman doing her own DIY work!! We just bought a house and will close on it in a couple weeks. The kitchen cabinets need to be redone because they still have pulls in the middle of the doors- eek. I'm thinking about using a sprayer to paint them, did you try that or did you just do rollers? Do you have any up close pics? What about a sealant? OMG, I love it!! I will be pinning this for future DIYs! This is what I want to do with our cabinets! I love the clean look of the white, you are a brave soul for undertaking it though! The cabinets look gorgeous!! Way to go! For your cabinets I would suggest removing the pulls, then sanding the finish off the cabinets. Fill the holes with wood filler, let dry completely, then finely sand over the wood filler until it's even with the rest of the cabinet. I would suggest not spraying your cabinets. I used a brush for the entire cabinets. Because I used semi-gloss paint, I did not seal the cabinets. The semi-gloss paint acts as a sealer so the wood won't get damaged and is very easy to wipe dirt off of or repaint if necessary. However, if I would have stained my cabinets rather than painting them, I would have sealed them after. I didn't get any close ups of the process and completely forgot to get the hardware pictures. At the time I wasn't blogging and didn't think about an instructional post. Hope this helps! Let me know if I can help any further! I'm usually scared to attempt a big project like this, but you make it sound very do-able. Yours look beautiful! Love your tip to label the doors and put the matching hardware in their own baggie. Those would be things that I forgot to do and wouldn't be able to put things back where they came from. I'm finishing up redoing six cupboard doors and 16 drawers. My kitchen has a drastically different look and feel! It cost me around $75 to buy the paint stripper, stain and other supplies. I couldn't have replaced a cupboard for that little! Great tips. I almost had to do this with a house I was thinking of buying, but I bought a house that already has white cupboards instead lol. This is an awesome post that I really needed to stumble upon! I have been wanting to redo our cabinets forever, but I am so intimidated. This is very helpful! Would love to do this to our kitchen! Thanks for sharing! we are about to do this to our cabinets!! So excited hahaha! Thank you. Awesome job! I will definitely pin this for future reference! The cabinets came out great! I know kitchen remodeling is one of the most expensive things! Great job! We just renovated & replaced our cabinets, so I know how much that costs. This is a better way on budgets for sure! Wow, night and day difference! Glad to know I don’t need a professional to do this! Yes! It is totally doable! Your end result is fantastic! I’m so super scared to DIY with our rental, but have book marked for the future. Thanks for sharing! Don’t be scared! Everything is fixable! And with this method, if it gets messed up, just start over. It won’t break the bank if you need to start again. 🙂 Good luck! I have never done anything like that before. Looks like fun though! Thanks for sharing at Bloggers Spotlight. I pinned this to our group board. Don’t forget to come back on Jan 7 to link up again and checkout the features. Wow, all that work was worth your effort! Your kitchen is beautiful! Whenever we get done rebuilding our five outbuildings lost in the 2015 Valley Fire I am determined to refinish our kitchen cabinets. I plan on using General Finishes Java Gel Stain. Thank you! It was extremely satisfying! I love when I can make such a huge difference without spending a lot of money. You will be just as satisfied when you are done!